High Peaks Wilderness Area Needs Bold, Comprehensive Management | Protect the Adirondacks! As winter shows sure signs of releasing its grip on the Adirondacks, a new hiking season in the High Peaks Wilderness is coming into view. 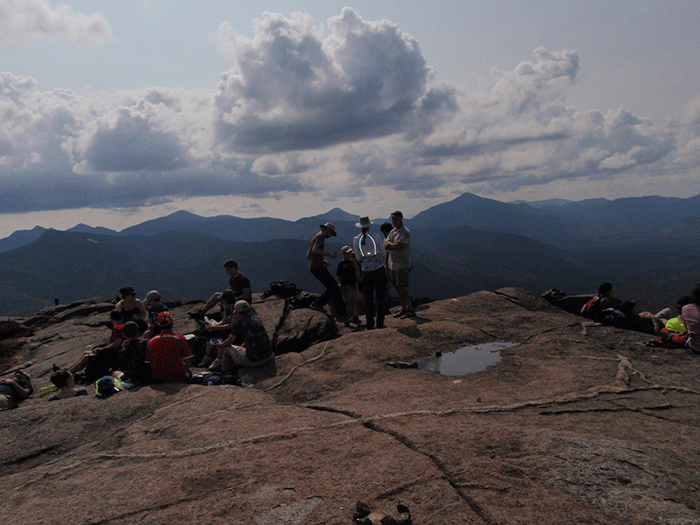 The allure of the High Peaks is immense for hikers, which is understandable. There is simply no other place anywhere east of the Mississippi River that provides the experience like that found on the summit of an interior High Peak surrounded by dozens of others. The views from the summits of Gothics or Colvin or Colden or Haystack mountains, or any number of other High Peaks, are simply stunning. The High Peaks Wilderness is in the midst of a major boom in the number of hikers, which has stressed the region’s management. This article is the second that examines the major questions facing the management of the High Peaks. The first article dealt with the need to build a sustainable trails system. This article focuses on the need to build a new, comprehensive management system that integrates the High Peaks, Hurricane Mountain and Giant Mountain Wilderness areas. The importance of the High Peaks Wilderness unit in the Forest Preserve and New York State demands improved management. The challenges are immense because of the crowds and because of the vast and varied landscape involved. The Forest Preserve in the Adirondack Park is a checkerboard with big blocks of Wilderness lands and fragmented Wild Forest areas crisscrossed with roads, power lines, and private lands. There are hundreds of access points to both Wilderness and Wild Forest areas, many far flung, which provide 24/7 access every day of the year. There are dozens of access points to the High Peaks and associated Wilderness areas. The High Peaks Wilderness is the most popular and heavily used area among the 2.6 million acres of Wilderness and Wild Forest areas in the Adirondack Forest Preserve. It’s a landscape unlike any other in the Adirondacks and one that cries out for new and improved management. A comprehensive management system for the High Peaks will not be cheap, but when New York State can spend more than $9 million to build a new, unnecessary campground at Frontier Town, that at best will see a fraction of the use of the High Peaks, it can certainly marshal the serious resources needed. For reasons unknown the Cuomo Administration simply refuses to adequately invest in the High Peaks. What would a new and improved management system for the High Peaks, Hurricane Mountain and Giant Mountain Wilderness areas look like? In addition to building a sustainable trails network, here are the key elements of a new comprehensive management system for the High Peaks and associated Wilderness areas. Education and Interpretation: One of the most significant management programs in the High Peaks is the multi-award winning Summit Stewards program, which has helped to protect rare alpine summit vegetation on a dozen mountaintops and has educated hundreds of thousands of hikers about Leave No Trace (LNT) practices for backcountry recreational use. This type of direct public education is indispensable and highly effective. Changes in the management of Forest Rangers has limited their backcountry presence and their ability to directly educate large numbers of hikers. A hiker who is educated about LNT has a lower impact than an uneducated hiker. The best opportunities for educating hikers are at two points of their hikes: when they arrive at a parking area or trailhead and when they reach a mountain summit. The Summit Stewards have covered the most popular summits, and in the last two years the 46ers have pioneered trailhead education. The work of the 46ers at Cascade Mountain, for instance, to provide outreach to hikers was very successful and this type of work needs to be expanded to a number of popular trailheads and parking areas. DEC staff undertook similar outreach and education work when parking for Cascade Mountain was shifted to the Mount Van Hoevenberg Ski Center last fall. The top picture shows the Summit Steward interacting with hikers on the summit of Cascade Mountain. 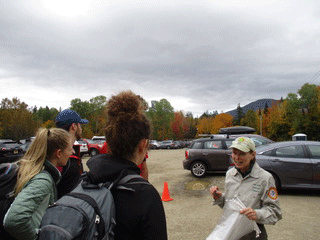 The picture above shows members of the 46ers undertaking education and outreach with hikers at the Cascade Mountain Trailhead. This type of education and outreach needs to be expanded in the High Peaks. Trailhead stewardship needs to be formally organized and could be undertaken so that the busiest dozen trailheads are covered by trained public outreach staff, especially on weekends. Trailhead education needs to be supported by robust online information about hiking in the High Peaks that is updated regularly. Northway rest areas also need to be improved with special displays about hiking in the High Peaks, with appropriate signs on the highway that encourage hikers to stop in, and the Beekmantown station needs a display in French as well as English. The Northway “High Peaks North” station has one display case about hiking preparedness, but nothing about LNT. There are no LNT brochures for visitors to take with them. 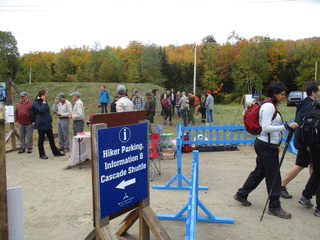 There is nothing specific about hiking in the High Peaks and hiking etiquette. The new Adirondack Information Center north of Exit 17 on the Northway has zero information on LNT or about hiking in the High Peaks, though it encourages the public to buy the NY Fish & Wildlife app. Safe Parking at all High Peaks Trailheads: The problems of trailhead parking in the High Peaks is that parking areas fill up quickly and early on most weekends and summer days, and, now, on many winter weekends too. This is not new, but something the state has been wrestling with for more than 20 years. The 1998 High Peaks Unit Management Plan states “Parking problems routinely occur at the Garden, South Meadows, the AuSable Club, and along NYS Route 73. In each case, the number of parked cars is often triple the desired capacity.” (p 92) The state’s response has been twofold. First, the successful Keene shuttle has stopped overflow problems at the Garden parking area, which created problems for local residents, but facilitates overuse. Second, overflow parking has long lined the roadside for miles on Route 73 at busy times. Across the Adirondacks parking lots at Forest Preserve trailheads have been used to limit public use, which is first-come, first served. Think of the tralheads at Little Tupper Lake or Lake Lila. This system is overwhelmed when public spillover parking is allowed unchecked on roadsides, which was the case until recently on the Route 73 corridor, and continues to be the case along the Adirondack Loj Road and at the Ampersand Trailhead on Route 3. Parking is important for two reasons: hikers need a safe place to park and start their hike; the size of a parking area should bear some relationship to the intended use of an area. In the High Peaks, it’s been a free for all. The Keene Town Supervisor has aptly referred to the dangers of roadside parking on Route 73 as a 55 mph parking lot. The DEC has taken some steps to control use. They signed long stretches of Route 73 near the Roaring Brook/AuSable Club parking areas with “No Parking” signs. The area begs for a longer term solution between improved off-highway parking and possibly shuttles. At Cascade Mountain the state has looked longer term to sharply limit roadside parking on Route 73. They are in the process of rerouting the Cascade trail so that the public can park safely in the ample parking lots of the Mount Van Hoevenberg Ski Center. This will provide the opportunity for better trailhead education as well. The new trail up Cascade is unlikely to be completed this year and the transition for most public use from the Route 73 trailhead to the Van Hoevenberg new trail will take a few years to be fully phased in. Yet, this is progress and shows a commitment by the DEC to look for a long-term solution at Cascade. The other major parking dilemma is the miles of cars that spill out of the ADK lot at Adirondack Loj. Parking along the Adirondack Loj Road is not as dangerous as Route 73 given the lower speeds, but points to chronic management failures. Parked cars often run for miles from the Loj to beyond the South Meadow Road. Parking is ad hoc on the South Meadow Road, an unnecessary protrusion into the Wilderness. Concurrently, DEC will construct a new 100 vehicles South Meadows parking facility near the intersection of Adirondack Loj and South Meadows Roads within 500 feet of the wilderness boundary as permitted by the APSLMP, making this the main point of entry into the HPWC. In conjunction, DEC will request the Adirondack Mountain Club voluntarily hold their parking lots to a maximum capacity of 200 vehicles. A coordinated effort is required and reference is made to ADK’s Heart Lake Property Master Plan (1992) for the Club’s position. The South Meadows parking lot will by constructed by YEAR TWO. The recommendations in the 1998 High Peaks UMP to close the South Meadows Road and build a new parking lot there were the right ones. A parking area at South Meadows would both limit public use and provide opportunities for public education and outreach. There’s a similar need for a safer parking area at the Ampersand trailhead with a new off-highway parking area. Public Recreational Use Decisions Should be Driven by Science: Perhaps the biggest challenge for state managers is to create a system within the DEC that effectively measures public recreational impacts to facilities, such as trails and campsite, to natural resources, and to the Wilderness character of these lands. The state has struggled to do this effectively and consistently over the years. The state struggles to do basic things like gathering and tracking public use with trailhead registration data, which historically has lots of gaps, to say nothing of more complicated recreational management use analyses. The High Peaks UMP amendment approved last year included a skeletal program for long-term monitoring of the “carrying capacity” of High Peaks Wilderness. The DEC stated that this plan will be constrained by limited resources and that it will be phased-in accordingly. The DEC’s program is built on identification and long-term monitoring of changes to a series of indicators that shape the public’s use, impacts and experiences in the High Peaks. This program marked a departure from boilerplate language in recent UMPs about complex monitoring programs that were never undertaken. This program marks a step-change at the DEC and Adirondack Park Agency (APA) to try and start some form of long-term scientific analysis program to measure the impacts of public use. The big questions going forward concern DEC’s staffing commitment to this enterprise, the quality of the data and analysis, and how this analysis will be used to shape management. Ideally, some kind of “carrying capacity” analysis would help to determine the acceptable level of public use in different areas of the High Peaks, such as the number of people on a trail or mountain summit and the ability of an area to withstand this use. In this way, science would drive management. All facilities, such as campsites, the size of parking lots, the level of trail work, placement of education and outreach staff, among many other things, would be driven by this type of scientific analysis. Permits for the Certain Trails and Mountains: Recently, proposals have been released for permit systems for trailhead parking areas and for hiking trails. While permits in some form for hiking in the High Peaks is a historic inevitability, the State of New York is currently ill-equipped to undertake these actions. Yes, the arc of Adirondack history bends towards permits in the High Peaks, but the challenge is that the state simply can’t move from 0 to 60 mph in a place as complicated as the High Peaks. The APA and DEC do not possess either the leadership or personnel to manage a comprehensive and functional permit system. The state has experimented with a day use permit system at the popular Blue Hole in the Catskills and has long charged for reservations at State Campgrounds. The Blue Hole experiment was largely successful and has perhaps emboldened the state to start to think broadly about a permit system in the High Peaks. The state abandoned a permit system for the Essex Chain Lakes, but that system was poorly designed and made no sense given low public use due to the state’s failure to coherently classify those Forest Preserve lands. Permits are widely used to regulate access to wildlands across the U.S. Some form of Mount Katahdin-style permit system makes sense for the most popular mountains in the High Peaks, especially on weekends. While permits would transform use in the High Peaks, they are consistent with the long trajectory of management changes that have slowly been implemented, like bear canisters for food storage while camping, bans on campfires and glass bottles, group size limits, and leashed dogs, being the most significant. The state should look at pioneering a permit system on weekends and summer days in July and August for Giant Mountain or Cascade Mountain. Other Major Management Actions: There’s a direct relationship between the quality of High Peaks management and the number of staff at the DEC dedicated to the High Peaks. State staffing is barebones. For instance, there’s no science director at the DEC for the High Peaks. There’s no education director. 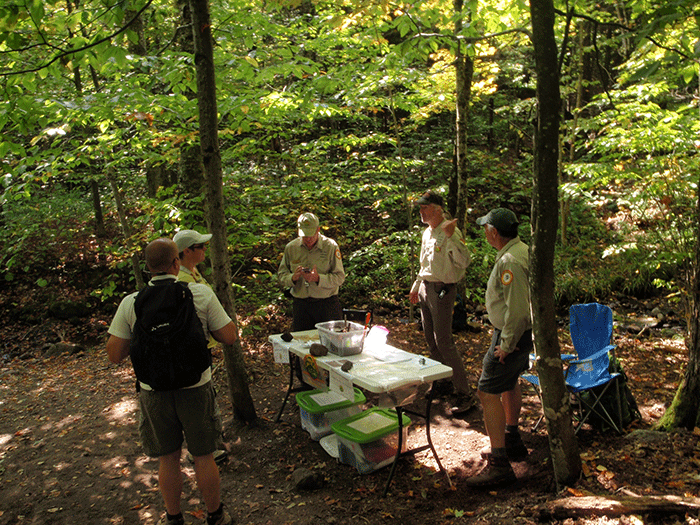 Clearly, more Forest Rangers are needed across the Adirondacks and Catskills, but especially for those focused on the High Peaks Wilderness. The DEC would be well advised to overhaul the High Peaks Wilderness UMP to codify changes in management. The re-establishment of the High Peaks Citizens Advisory Committee would be a positive step, create an opportunity for regular feedback, and create a system of accountability. The DEC should look at major issues, such as building trails on the trailless peaks where many mountains see a maze of herd paths. The DEC has taken steps to limit parking on Route 73 at Roaring Brook, is working to reroute the Cascade trail, has approved a formal nascent carrying capacity monitoring program, held a series of meetings with stakeholders, is building new pit privies along many popular trails, and is exploring new parking hubs/shuttles at the Route 9/73 intersection or Frontier Town. These are all pieces of the comprehensive management system that needs to be organized for the High Peaks. It’s high time for the Cuomo Administration to act boldly and deliberately and make the badly needed investments in the management of the High Peaks, Hurricane Mountain and Giant Mountain Wilderness areas. Next post: Forest Preserve intern positions available in the High Peaks Wilderness. Help protect the Forest Preserve.